Configuring NGINX for SSL termination with varnish can be tricky to get your head around. Even looking at articles found online, it can still be difficult getting the configuration right. Eventually, after some reading and trial and error, we developed a configuration that worked. 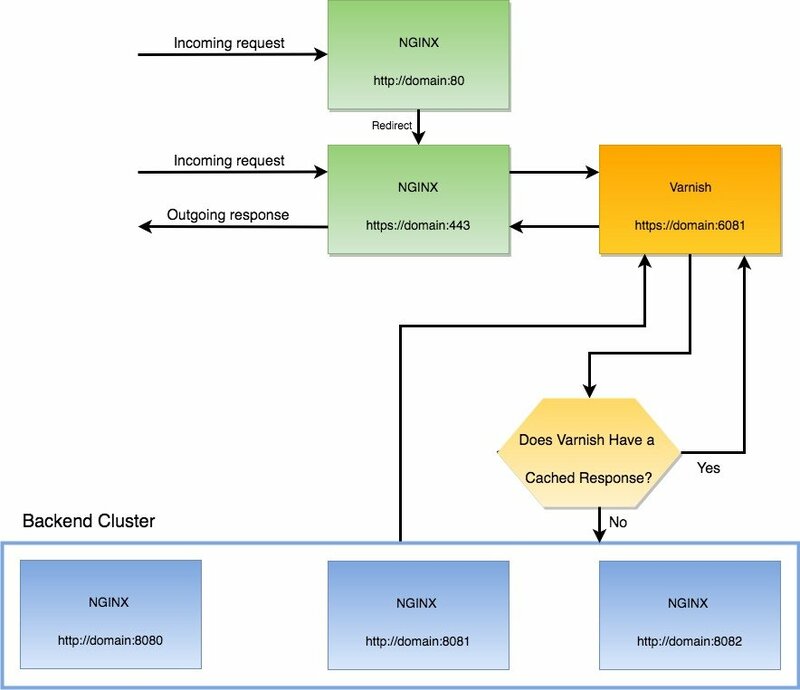 The below graph shows how nginx handles incoming requests and how they are passed off to varnish, and then back to nginx if required. The above image shows that any HTTP request is immediately redirected to our HTTPS configuration in NGINX. E.g. In the HTTPS (443/SSL) configuration, we use the below configuration to pass the request to Varnish to serve either cached request or get it from our backend. The configuration for SSL/443 should be fairly minimal as the configuration for the Magento website (e.g. $MAGE_ROOT) will be declared within the port 8080 NGINX config area. You should also include the Magento 2 Varnish configuration settings (located under STORES > Configuration > ADVANCED > System > Full Page Cache). And finally, we have our NGINX configuration for port 8080. As mentioned earlier, in the port 8080 configuration you should use the usual Magento NGINX configuration settings.